To establish, maintain and support respirations. To provide warmth and prevent hypothermia. To ensure safety, prevent injury and infection. To identify actual or potential problems that may require immediate attention. The most important need for the newborn immediately after birth is a clear airway to enable the newborn to breathe effectively since the placenta has ceased to function as an organ of gas exchange. It is in the maintenance of adequate oxygen supply through effective respiration that the survival of the newborn greatly depends. Newborns are obligatory nose breathers. The reflex response to nasal obstruction, opening the mouth to maintain airway, is not present in most newborns until 3 weeks after birth. 1. Wipe mouth and nose of secretions after delivery of the head. 2. Suction secretions from mouth and nose. 3. A crying infant is a breathing infant. Stimulate the baby to cry if baby does not cry spontaneously, or if the cry is weak. Do not slap the buttocks rather rub the soles of the feet. Stimulate to cry after secretions are removed. High, pitched cry – indicates hypoglycemia, increased intracranial pressure. 4. Oral mucous may cause the newborn, to choke, cough or gag during the first 12 to 18 hours of life. Place the infant in a position that would promote drainage of secretions. Side lying position – If trendelenburg position is contraindicated, place infant in side lying position to permit drainage of mucus from the mouth. Place a small pillow or rolled towel at the back to prevent newborn from rolling back to supine position. 5. Keep the nares patent. Remove mucus and other particles that may be cause obstruction. Newborns are obligatory nose breathers until they are about 3 weeks old. It is part of the routine care of the newborn to give prophylactic eye treatment against gonorrhea conjunctivitis or opthalmia neonatorum. Neisseria gonorrhea, the causative agent, may be passed on the fetus from the vaginal canal during delivery. This practice was introduced by Crede, a German gynecologist in1884. Silver nitrate, erythromycin and tetracycline ophthalmic ointments are the drugs used for this purpose. These ointments are the ones commonly used now a days for eye prophylaxis because they do not cause eye irritation and are more effective against Chlamydial conjunctivitis. Apply over lower lids of both eyes, then, manipulate eyelids to spread medication over the eyes. The newborn has a sterile intestine at birth, hence, the newborn does not possess the intestinal bacteria that manufactures vitamin K which is necessary for the formation of clotting factors. This makes the newborn prone to bleeding. 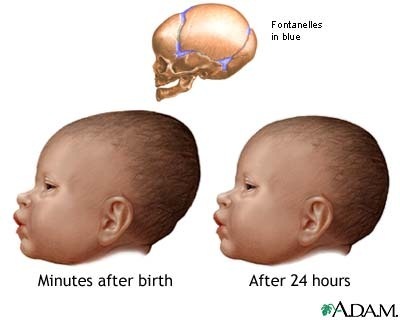 As a preventive measure, .5 (preterm) and 1 mg (full term) Vitamin K or aquamephyton is injected IM in the newborn’s vastus lateralis (lateral anterior thigh) muscle. 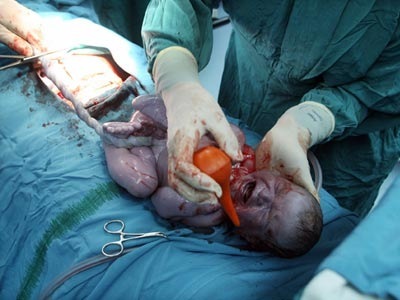 The cord is clamped and cut approximately within 30 seconds after birth. In the delivery room, the cord is clamped twice about 8 inches from the abdomen and cut in between. When the newborn is brought to the nursery, another clamp is applied ½ to 1 inch from the abdomen and the cord is cut at second time. The cord and the area around it are cleansed with antiseptic solution. The manner of cord care depends on hospital protocol. What is important is that the principles are followed. Cord clamp maybe removed after 48 hours when the cord has dried. The cord stump usually dries and fall within 7 to 10 days leaving a granulating area that heals on the next 7 to 10 days. No tub bathing until cord falls off. Do not sponge bath to clean the baby. See to it that cord does not get wet by water or urine. Do not apply anything on the cord such as baby powder or antibiotic, except the prescribed antiseptic solution which is 70% alcohol. Avoid wetting the cord. Fold diaper below so that it does not cover the cord and does not get wet when the diaper soaks with urine. Leave cord exposed to air. Do not apply dressing or abdominal binder over it. The cord dries and separates more rapidly if it is exposed to air. If you notice the cord to be bleeding, apply firm pressure and check cord clamp if loose and fasten. Report any unusual signs and symptoms which indicates infection. 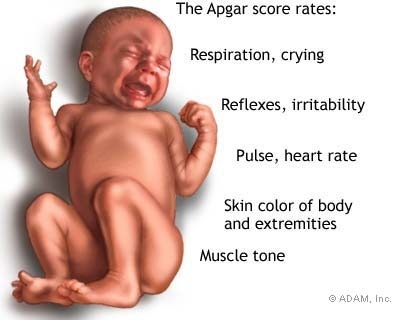 The APGAR Scoring System was developed by Dr. Virginia Apgar as a method of assessing the newborn’s adjustment to extrauterine life. It is taken at one minute and five minutes after birth. With depressed infants, repeat the scoring every five minutes as needed. The one minute score indicates the necessity for resuscitation. The five minute score is more reliable in predicting mortality and neurologic deficits. The most important is the heart rate, then the respiratory rate, the muscle tone, reflex irritability and color follows in decreasing order. A heart rate below 100 signifies an asphyxiated baby and a heart rate above 160 signifies distress. Severely depressed infant, in need of resuscitation.